Imhotep Panthers running back Mike Waters gets a hug as he holds the PIAA 3A state-championship trophy at Hershey Park Stadium on Dec. 18, 2015. The Panthers, led by Waters 201 rushing yards and three touchdowns, became the first-ever Philadelphia Public League team to win the title. 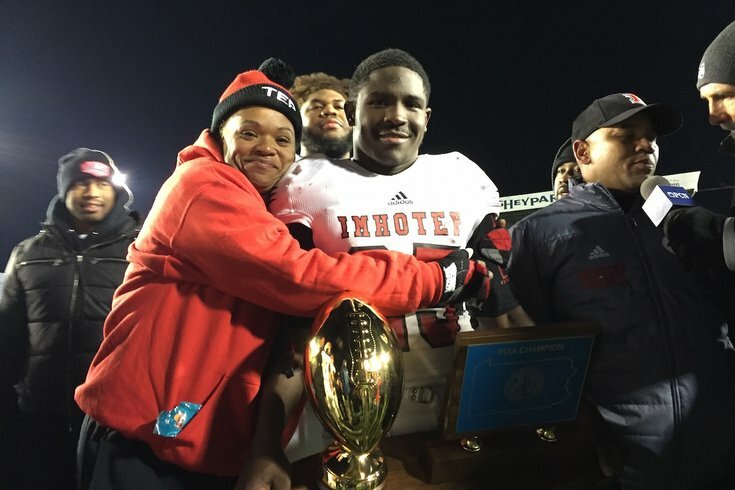 The Imhotep Institute Charter High Panthers football team went to Hershey to make history. With a dominating 40-3 win over the Cathedral Prep (Erie) Ramblers, they did just that. Now, the Philadelphia Public League can boast that one of its teams won a state football championship. The Panthers – who lost in the 2013 title game – were led by running back Mike Waters’ 201 rushing yards, including touchdown runs of 62, 53 and 3 yards. Aamir Brown added two touchdowns (one rushing, one receiving) and Isheem Young was responsible for the other. Head Coach Albie Crosby put things into the big-picture perspective of a team that comes from an area where children are getting shot and need positive outlets, like playing football, to get their life on the right track. He also acknowledged the momentous aspect of being the first-ever Public League team to win a state title. After the game, Waters was besieged by adoring fans. He spoke about what he and his team had just accomplished, that being hoisting the state championship trophy and ceremonial Hershey bar over their heads on the field. Despite all the celebrations surrounding the lopsided score over a two-time state championship program, it didn’t always look easy. The game started off chaotically, with a Ramblers onside kick going out of bounds and a vicious hit that leaving their sophomore wide receiver Henry Fessler wobbly. Imhotep’s Brown fumbled the re-kick, giving Prep a first down at the Panthers’ 36. On the first play of that drive, a Ramblers lineman was pushed back into a referee, causing another stoppage of play as he gathered himself. 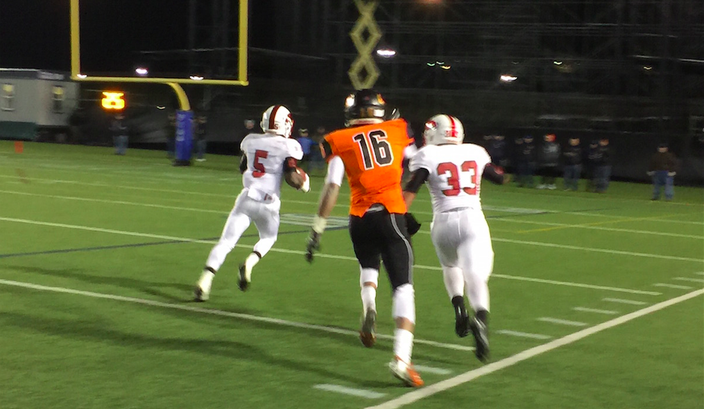 Imhotep then forced a change of possession on downs, a favor that Cathedral Prep returned on the next possession. Imhotep then forced a punt, but Isheem Young fumbled, falling on the ball at their one-yard line. On the next play, Waters fumbled after a 12-yard gain, setting Cathedral Prep up for a 30-yard field goal with 6:09 remaining in the first quarter. The Panthers responded with a rushing attack – all Young and Waters – that ended with a five-yard Young touchdown and two-point conversion, giving Imhotep an 8-3 lead with 3:15 remaining in the first. After a three-and-out led to a punt, Imhotep drove into Cathedral Prep territory, but Nasir Boykin threw an interception to Ta’Nauz Gregory, who returned it to the Panthers 19 just before the end of the first quarter. The Ramblers then missed a 17-yard field goal and a 46-yard carry by Young ended with a Cathedral Prep player being taken off the field on a medical cart with a leg injury. A muffed snap on a punt led to the Ramblers starting a drive at their own 39 with 8:30 left in the half but within two minutes, Imhotep’s Brown snagged an interception. Waters then scampered 62 yards to give the Panthers a 14-3 lead with 6:30 left in the half. From there, the Panthers defense stepped up and, after a short punt, took over at the Cathedral Prep 42 with 4:18 left. After converting a fourth-and-one, Imhotep tight end Naseir Uphsur made a catch at the 13, quarterback Nasir Boykin scrambled to the 3 and Waters ran into the end zone, giving the Panthers a 20-3 lead with 1:54 left in the half. With the clock running down, the Ramblers put together a solid drive, which put them at Imhotep’s 16 with 11 seconds left in the half but a trio of incompletions sent them into the locker room down 17 points. The Ramblers started out the second half with a nice drive but turned the ball over on downs. A 35-yard pass Nasir Boykin pass to Nasir Lewis led to a 13-yard Brown touchdown run and a 26-3 lead with 8:06 left in the third quarter. The Panthers defense then stopped the Ramblers on fourth and two at the Imhotep 26. In the subsequent drive, Upshur caught a 38-yard-pass, but the big play was a 41-yard touchdown pass from Boykin to Brown. At the end of the third quarter, Imhotep had a 34-3 lead. A 53-yard Waters touchdown with 6:58 remaining drove the final score to 40-3. In many ways, Imhotep’s return trip to Hershey started at this very stadium two Decembers ago, when the Panthers became the first Philadelphia Public League school to reach the state championship. On that bitter afternoon, they were outclassed – and shutout 41-0 – by a team from South Fayette, located southwest of Pittsburgh. Their 2014 season ended with a loss to an Archbishop Wood team in the city title game, but this year, they avenged that loss with a thrilling 20-14 win. From there, they defeated Academy Park (from Sharon Hill, Delaware County) 46-16 and, in the state semifinals, trounced Saucon Valley (from Hellertown in the Lehigh Valley) by a 72-27 score. 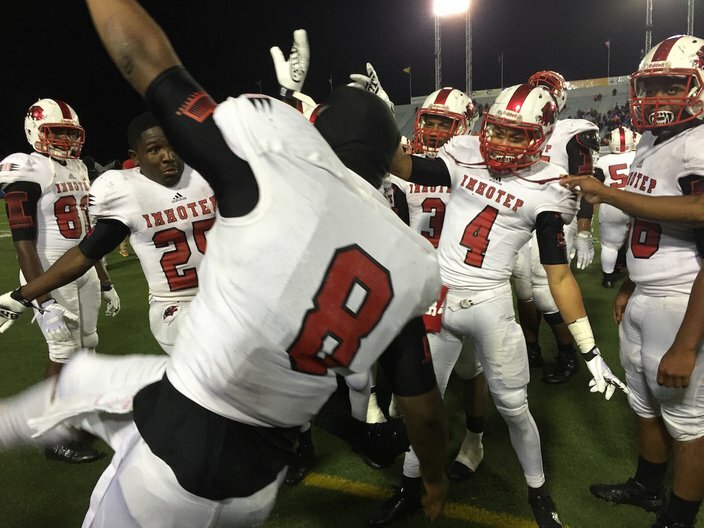 Aside from Archbishop Wood, none of the 14 teams Imhotep defeated this season came within 17 points of victory. In seven games, they held the opposition to zero points. The cumulative season’s score before Friday night was 662-101.